Cora Thornhill was an astounding beauty of vampiric heritage. She embraced her vampiric roots early in her life and she explored vampiric magic throughout her life. She was a Gothic beauty with dark tendencies when it came to magic and she indulged in her psy vampiric origin through feeding on power and energy. 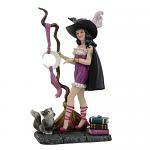 She learned to use her predatory gifts and abilities to gain influence in her many facets of magic. She was devoted to the darker skills and learning how to use darker veins of magic to inspire her gifts and achieve more in her pursuits of the supernatural. She was a master in working with many styles and types of magic. She took great care in every aspect of her work, and she matched her passion with her vampiric roots with the vigor of her divine motivation. She was very integrated in working with eternal & immortal paths. She was constantly looking for measured means to claim her abilities, power, and resolve to be more involved. Cora's estate was filled with exceptional artifacts that spoke to dark and mystical gifts as related to vampirism, immortal power, and dark magic. These artifacts are for someone who has vampiric roots in their ancestry, who is pursuing work with the immortal, and diving into the darker side of the ethereal. Cora was never one to back down from darker opportunities of magic, she explored ancient practices, texts, traditions, and worked with other practitioners, spirits, and artifacts related to the supernatural. She felt she resonated with greater effect to the ancient practices of the vampyr than to the new-age world of vampiric magic. We recommend that only those who have some experience with magic consider Cora's estate bindings. All of her artifacts are devoted to more involved and complex forms of vampiric and dark magic. She loved working with more exceptional depths of magic, and she was consistently devoted to her evolution as she wanted to grasp as much of her vampiric roots and vampiric abilities as she could reclaim from her ancestry. This makes her magic very personal and very involved on many different levels, and something that is exceptional with every facet. You will find her artifacts are bold, very intense, and have a depth of power to them that is unlike any other. Through every Full Moon cycle you will have the strongest opportunity to work with magic for evolution and transformation. Cora discovered and worked with the multi-faceted conections the Vampyr shared with the Moon and lunar forms of magic. She studied and worked with connections found to be strongest in materialization with Vampiric power. Cora felt Vampiric magic was something that fed her the motivation and support she needed to advance her gifts and welcome new power into her life. You will feel the Moon's supernatural powers surround you and inspire you from within. Cora put a lot of time and effort into the details of this binding, and she wanted to create a binding that would foster an environment where transformation could be realized through work with rituals and magic focused for the intent of transformation and evolution. Cora found this binding to be the most influential when it came to discovery and understanding of herself and where she wanted to be with her gifts. She created this binding in order to materialize a supernatural connection with the Moon and how transformation can be facilitated through lunar origins. When you work with the binding, the enchantments help you work through various forms of transformation & evolution that come when you work with various types of magic, spells, and rituals. Transformations through magic can help you work & develop various facets of supernatural gifts and abilities. You can experience personal and mystical advances of magic through Cora's binding, and the dark, prismatic enchantments found within are intoxicating and exciting. The spells bring you a closer connection to the powers and opportunities you hold from within, and draws a closer connection for you with Lunar magic, spells, and evolution. 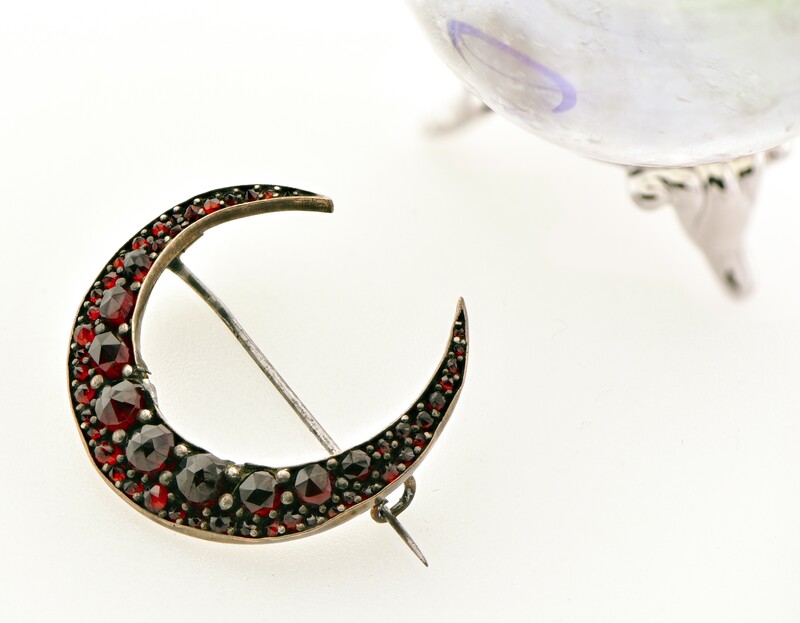 The spells are incredible potent, and the pin seems to come to life with lunar energy through every Full Moon. You will love the power and diversity of this artifact, and how enveloping its gifts are for yourself and your future in work with magic. She wants you to feel every facet of magic as it comes to you, and her Vampyr lunar spells will be exceptionally evolutionary for your skills in working with magic. The spells renew every Full Moon until deactivated. It is deactivated by holding or wearing the pin and saying "At rest be settled the Vampyr's touch". Vessel is an antique, Victorian-era garnet & gold wash pin. There are no further discounts to one of a kind estate items as they are priced at the lowest possible price.